Graviola tree, also known as soursop, is found in tropical areas of the world. Its leaves have a long history of use by traditional herbalists. More recent scientific studies suggest that Acetogenins, the active constituents of Graviola, can support healthy cell growth and function. Other active compounds found in Graviola leaves have free radical scavenging properties. This double-strength, sustained-release formula reduces the number of pills down to 3 per day. Adult Dosage: Take 1 tablet, 3 times daily as needed. Not for long term use. Consult a health care practitioner for use beyond 4 weeks. sunflower lecithin, triethyl citrate], Silica. Do not use if you are pregnant or breastfeeding. Consult a health care practitioner prior to use if you have low blood pressure, or if you are taking prescription anti-depressants, MAO inhibitors, antihypertensives, or other cardiac depressant medications. 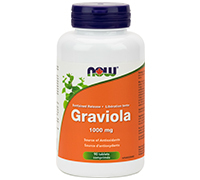 Do not use if you regularly consume graviola (soursop) fruit or tea, or if you have atypical Parkinson's disease. If sleepiness, nausea, or sedation occurs, reduce the amount used.